Kits with case include all case parts, assembled units with case come in the case. 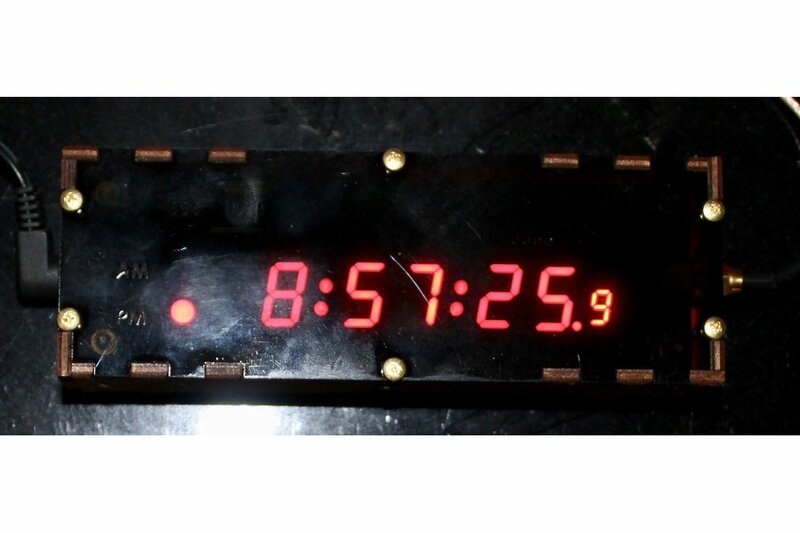 This is a GPS driven LED display desk clock. It is configurable (with buttons on the back) for almost any timezone (half-hour timezones are not supported) worldwide as well as for daylight savings time rules for the U.S., E.U., Australia or New Zealand (or DST off). The clock can display 24 hour time (00-23 hours) or 12 hour time with AM/PM LEDs. The display has colons between the two-digit groups for hour, minute and second that can be on, off or blinking at 1/2 Hz. The display brightness can also be adjusted (to any of 4 steps). The display consists of hour, minute and seconds as .56" red seven segment LEDs, and a .3" tenth-of-a-second digit. The display is multiplexed with a refresh rate of approximately 600 kHz. 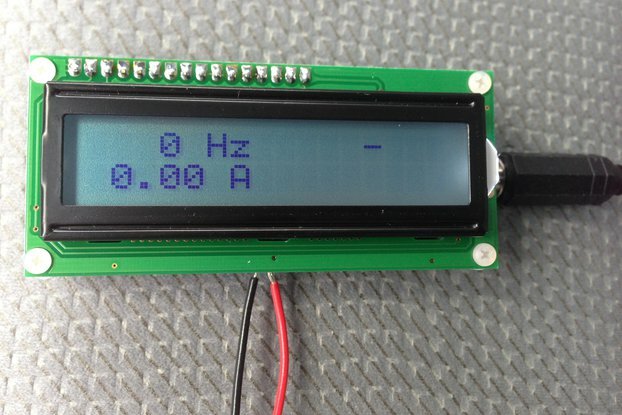 The accuracy of the display is within 200 µs of GPS time. Those two factors make it suitable for such things as time-stamping slow motion video. 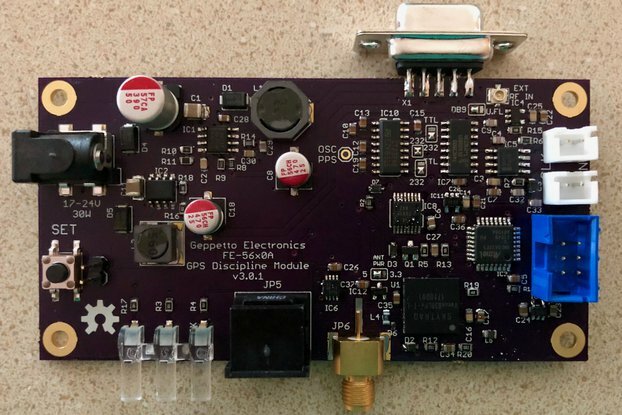 The board has a super-capacitor mounted on it to provide power to retain the satellite almanac for up to around 3/4 of an hour without power. It (optionally) comes with (or in) a laser-cut wood and acrylic case and with an AC power supply (90-240 VAC, 50/60 Hz, North American plug). 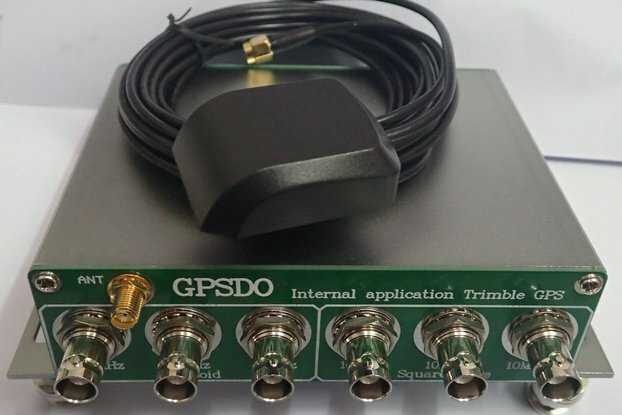 A GPS antenna is required and an active magnetic-mount "puck" antenna is optionally available. 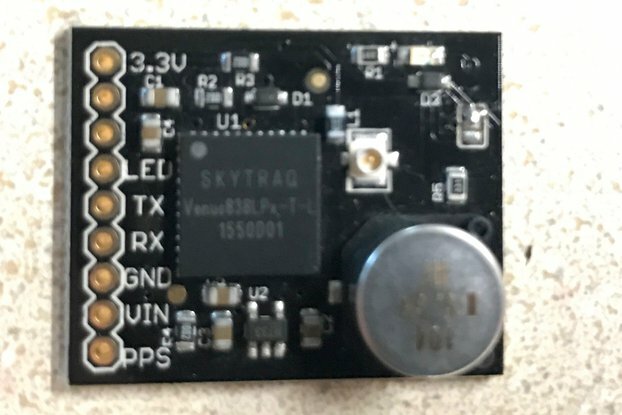 The GPS antenna connector is SMA and supplies 5 VDC power (there's a jumper on the board to change this to 3.3V if desired) for active antennas (up to 100 mA). 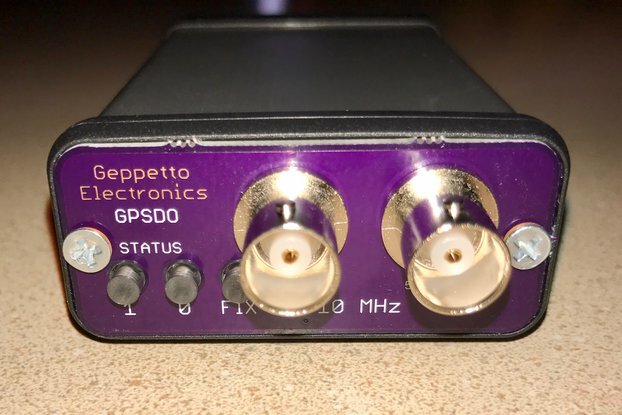 It is available either fully assembled and tested or as a "quick kit," with or without the case and power supply (5 VDC @ 250 mA, 2.1mm barrel connector, center positive). 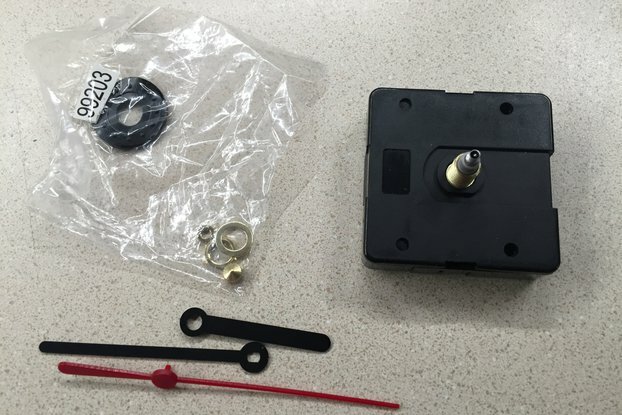 The "quick kit" means that all of the surface mount components are installed and programmed, leaving you to install the through-hole parts and assemble the case (if applicable). This is absolutely the most accurate human-readable clock for the price that I know how to make. It's a handsome and functional conversation piece for anyone interested in time. Easy to assemble kit. Had an issue with one of the 7 segment displays, emailed the seller and he replied immediately even though after hours. Had a replacement part in the mail that day. Great product, can't beat the service! I do have to point out that I've had to revise the specifications of the clock's accuracy down to 200 µs instead of 100 µs. The code in the interrupt handler for the PPS took longer than I had estimated, but the 200 µs figure is the worst-case accuracy measurement. Very good and excellent support from the developer. I built the clock from the kit, and put it into the supplied enclosure. It went together easily and worked first time. Anyone who has done any soldering before will have no trouble fitting the parts with a bit of care. I had a couple of questions and contacted the developer who was able to advise me very promptly. I bought the GPS antenna and it picks up the signal in an upstairs room with only a couple of small roof lights. I have seen it lose signal only a couple of times, presumably because of a particularly bad position of the satellite constellation at that time. If it was critical I could position the antenna outside. Due to a leap second update added recently, the clock is 2 seconds fast for approx 5 minutes, before it downloads the correction details, and then it is exactly correct. The developer is now revising the design to include a backup super capacitor to store the correction so that if there is a short power interruption, the clock will not have to wait for the leap second correction. 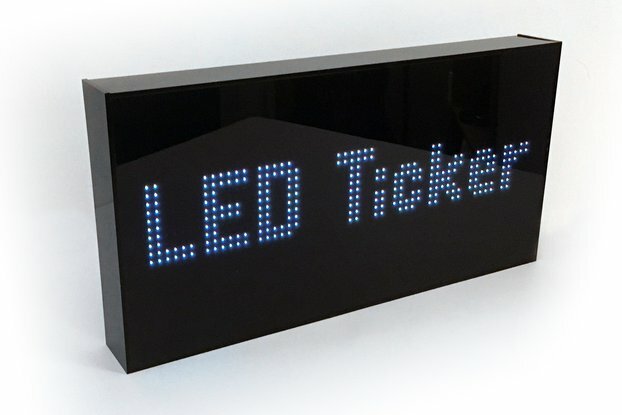 The LED clock display is bright and easily seen in full sunshine, and can be dimmed if you wish. The separators between H,M,S are decimal points, not colons which would have been nicer. The case is laser cut wood and can be painted, or stained as the developer suggested to me. I may do that. Black stain with the dark red acrylic front would look very good I feel. One other wish would have been for the antenna and power connections to have been on the rear rather on opposite sides, it would improve the appearance and make it easier to place beside other equipment on a shelf. The software is well thought out, giving all the options I require - Timezone, DST, 12/24hr, tenths of a second on or off, brightness control. The flashing LED for GPS fix is annoying, and not necessary, so I fitted the LED on the rear and can only see it through the hole beside the antenna socket now. 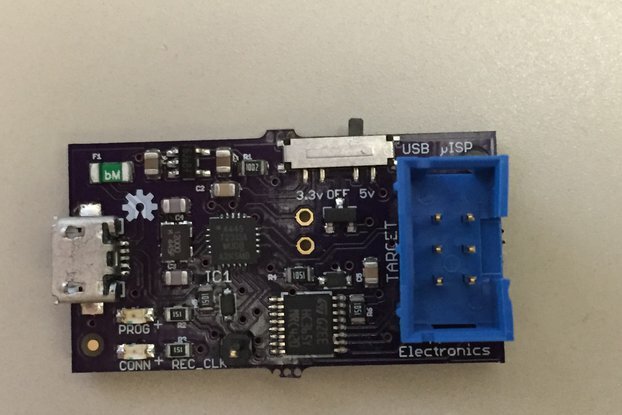 New boards will have a small LED on the rear as standard. It isn't needed at all as the clock displays NO GPS while it is unlocked anyway. I bought a small linear plug top 5V power supply for the unit, but it turned out to be unregulated and the voltage was too high as the load was so low, it caused no damage fortunately. I fitted a small 5 V linear regulator and that cured the problem. 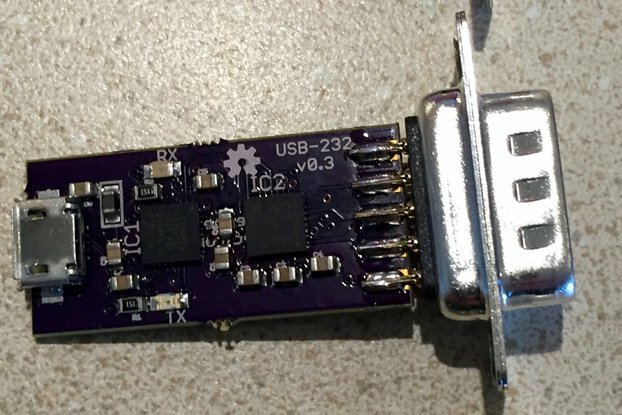 I would advise buying a proper 5V regulated supply, the one supplied from the developer would be fine I presume, I did not buy one because I was unsure if it would have a UK plug and used switched mode regulator which I am wary of because of potential RF noise issues. I have noticed no RF interference or RF immunity problems at all with the clock, which is important to me in my ham radio station. The buttons for setting it are on the rear and require something like a paper clip to press them, fortunately they are mainly set and forget. The price is very reasonable, especially if you are in the USA, however if you live in the U.K. be aware you will pay VAT and handling charges which adds quite a bit to the total. It is still a good deal I feel. The version now in the store has colons between the H, M and S digits and (as mentioned) the super-cap to preserve the almanac over brief (up to around 3/4 hr) power interruptions. Newer units also now have an SMD "FIX" LED mounted on the component (back) side (visible through the antenna hole). The power supply available for purchase with the unit is a switching supply that accepts 90-240 VAC 50/60 Hz, but has a North American plug. A passive plug adapter would be sufficient for world-wide use. Alternatively, any 2W @ 5 VDC supply with a 2.1mm center-positive barrel connector would work. This is a great clock. I bought mine allready prebuilt. Clocks buffs, Ham radio Guys, SWL's, buy this clock. You'll like it. Thank you very much for your kind words. 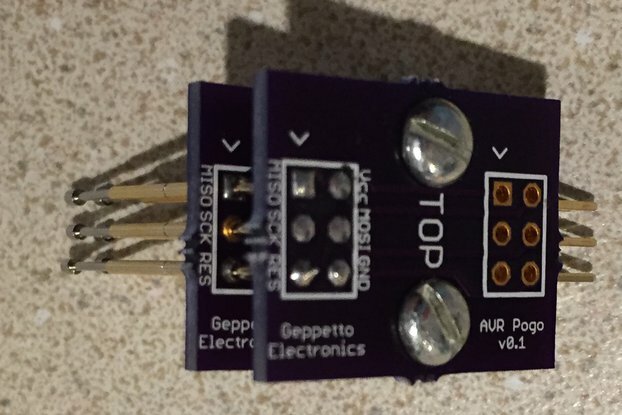 Another option for the FIX LED is to mount it on the component side of the board. It wouldn't be visible through the front panel, but you could check on it when desired by peeking in from the side or perhaps drilling an auxiliary hole in the back panel. I am very happy with this GPS that I bought two. The unit is very well made and there was little assembly required. Great little accessory to have in your hamschack. If you didn't receive your clock, please contact me so I can figure out what went wrong and make it right.